After sleeping off a storm in the tiny house on Mount Echo I headed through Ohio and stopped at the Newark Earthworks where Don Moder, the executive director, gave me a personal impassioned history of the indigenous people’s who constructed them. These earthworks are huge and amazing to hike around in. I can’t wait to come back and investigate the infamous Serpent Mound in Southern Ohio with some of my tiny house friends! You never know who you might meet at the next rest or truck stop! I met some ‘schoolies’ who had incorporated their perfectly level, floating DJ table right into their tiny home on wheels. Austin and Troy of noblesavage_us, please come to the Tiny House Jamboree! That red truck cab in the left corner was being repaired at the truck stop I slept at that night. Yikes, the cab was as long as my tiny – 18′! And there is always time to give an impromptu tour to a lovely group of ‘tiny curious’ women. I’m in there somewhere! However, that was not the only excitement of the day. I had my first FB tiny house stalker who found me! LOL. She’s a really great gal, a trucker. No wonder she figured out where I was. I wish I had heard here knock at the door. We could have had a slumber party! I headed for Fairfield, Iowa, the global capital of Transcendental Meditation training. I parked along the side of the town square and had fun looking at all the mini-libraries. The Silver Bullet was toured by Maharishi University professors, students, neighbors and the ‘tiny house curious’ as it sat at the Seed Center, in the middle of an idyllic farm field.Met so many lovely folks that really appreciated the net zero, all renewable energy tiny house I designed and built based on bio-mimicry.And everyone seems to enjoy my Tuftex awnings. Who knew? The Midwest is mostly flat. I grew up in Minnesota. It’s the beef belt, the dairy belt, the cheese belt, the corn belt and the wheat belt. So I could hardly wait to get to Colorado and the mountains! Because my July workshop venue got cancelled I would now have three weeks of vacation for myself! Yippee! I haven’t had one in five years, it’s about time. And my daughter tells me I was featured in the Boston Globe. Woot, woot! By the time I got to my parking spot I was so sick I could barely stand. Oh yeah, AMS, an acute case of elevation or mountain sickness. The vertigo and congestion kept me from climbing up to the loft. Thankfully I got over it by resting and drinking tons of water. I spent my 2nd weeks of vacation in Colorado Springs playing tourista visiting sites I hadn’t seen since the 1980’s! I visited a friend in Fort Garland who built his own tiny and have hosted many dinner-tours at the Silver Bullet with other tinyhousers and friends. I am currently completing two books and prepping my booth for the 2016 Tiny House Jamboree! I’ll be in Vendor Booth #13 next to Onduline and Unforgettable Fire (Kimberly stoves) so come on by for some tiny house talk and sustainable lifestyle education! My sustainable lifestyle workshop is being held on Saturday morning 9:30-10:00AM at the workshop area! Hope to see you there. “What do you mean your house breathes like an animal?” I’ve lived in several parts of the country where my homes suffered from too much moisture and mold (Atlanta,Asheville) and I wanted to design a non-toxic net zero home that would have the ability to dry itself off and maintain decent air quality. I did that by designing an innovative vented roof, baffles, eave vents and rain screen layers based on biomimicry. Read more here. “What are those adorable little spherical windows?” Derek Diedricksen, my tiny house mentor, turned me onto those 4 years ago, they are available here. “Why are you already needing a 2nd generation solar system?” My first generation solar system was two 1450Yeti Goal Zero packages. I found both the batteries bulky, because you have to have them inside and plug everything into them. That means cords all over the place and it is unsightly. Also, I found that they could not guarantee their panels would last for more than 825 charges. Plus after 8 months, the batteries had issues. After doing a keynote speech at the Georgia Tiny House Festival last year, I met some fellows from Renogy, a Canadian firm. I watched their demonstration, raised the funds for a robust 2000W system and it works beautifully for me most of the year with only 2-250W/24V panels; in the winter, I use all four panels in New England. Sometimes your back end will need a lift. 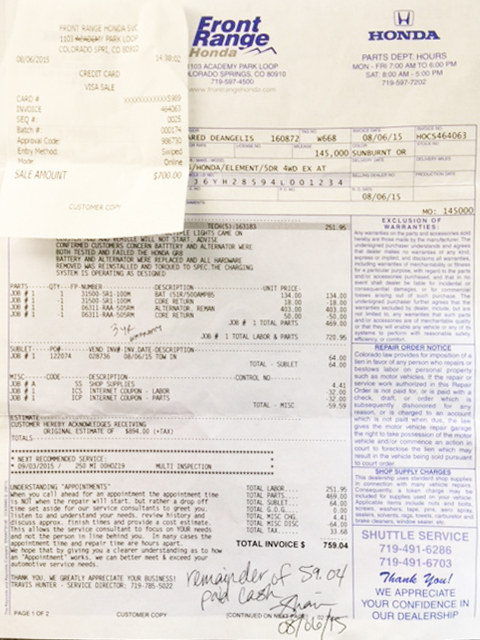 Timbrens will help Hi Ho Silver (my Ford 250 SuperDuty) haul my 9,280 lb. Silver Bullet and all my solar panels and tools. My anti-sway bars also help. Make sure you bring leveling blocks with you wherever you park. Try to suppress your disgust when revisiting pristine state and national parks when you see how they have changed after 40 years. It never gets old to see the excitement when folks visit and tour your net zero, all renewable tiny house. Hiking and walking in nature always brings a smile while soothing the soul. As several of my followers have been asking about workshops and tours, I wanted to post some of the events for 2016 even though I am not posting the Summer Tour Schedule yet. I hope to have a Spring workshop in April and will post it here first! So, please come and see me at any of these events and we can talk “tiny”! February 5-7, 2016: Speaker at Derek Diedricksen’s Small Build at the Fuller Craft Museum, Brockton, Mass. “Why Tiny? Why Now?” Hear from International Tiny House Jamboree speaker, Vera Struck, about the growing social tiny house movement that went viral. Learn how Vera’s affordable zero-waste tiny house, the Silver Bullet, is a resilient solution to the lack of affordable non-toxic housing, provides relief from the American debt culture, reduces one’s carbon footprint and provides a simpler, free and more substantive life in a world of diminishing resources. March 16, 2016: Keynote Speaker at the Greater Newburyport Village at the Newburyport 5 Cent Savings Bank Auditorium, 6:30PM. May 18-19, 2016: Silver Bullet Tiny House Summer Tour Launch and Tour at EBSCO Host Corporate, Ipswich, MA. October 8, 2016: Blue Ocean Music Hall, Salisbury, Mass. 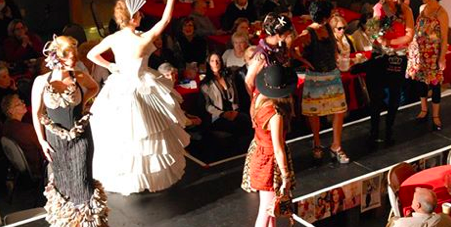 7 PM Rubbish to Runway Fashion Show to benefit Long Way Home. Our Founder, Vera Struck, will create two new eco-couture fashions for another sustainable education non-profit, Long Way Home, that will be featured at the renowned Rubbish to Runway Refashion Show! 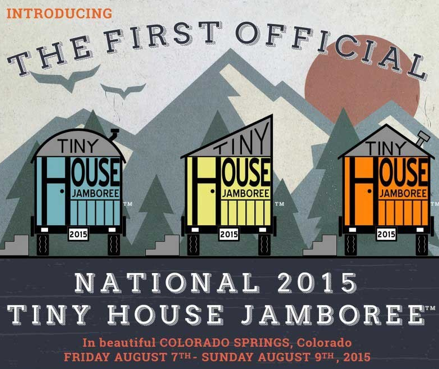 I had been looking forward to speaking at the 1st National Tiny House Jamboree in Colorado Springs for months. After driving for three days straight over 2200 miles from Northern New England, it’s a bit ironic that my car, which has not had a repair issue or breakdown during the ten years I have owned it, died 25 miles from the Jamboree sight in rush hour traffic at 92 degrees. I overcame so much to build my Silver Bullet Tiny House, this was just a blip on my radar. Six hours and $782. worth of repairs later, I had a new alternator, battery and wire connections replaced in my oldie, but goodie, 2004 Honda Element EX. I arrived at the Mining Museum grounds and saw all sorts of vendors and builders driving in their tiny houses and sprucing them up for the coming attendees. Tiny houses seem to be getting larger. When I got my trailer two years ago, 18 feet was considered large. As I toured these, I discovered most of them were 24 feet or larger and 13,000 lbs. plus. And yet, so beautiful, gorgeous, well planned and designed and such great ideas and sustainable concepts. After touring some of the tiny houses privately, I set out for the campground in time to set up my tent and get over to the Jamboree VIP party to meet the tiny house luminaries whose blogs I have followed and commented upon, whose books and DVD’s I’ve read and recommended to my workshop attendees and whose tiny house journeys I have admired for years. I was elated to put faces and such warm hugs and conversations to the names and images I have enjoyed in the online tiny house tribe. Best of all, I got to see my mentor and tiny house rock star, Derek “Deek” Diedricksen, speak on the 1st day. His speech was so awesome; inspiring, humorous, informative – he set the tone for the entire weekend of magical happenings and connections. As I returned to the campground every evening, I met folks from Europe, Canada and all over the USA. There were tiny DIY micro-shelters built on one axel trailer rigs as well as two large tiny houses on double axle trailers. A little camping tiny house tribe of our own with wild fire-dancing parties at night and discussions into the wee hours of the morning. 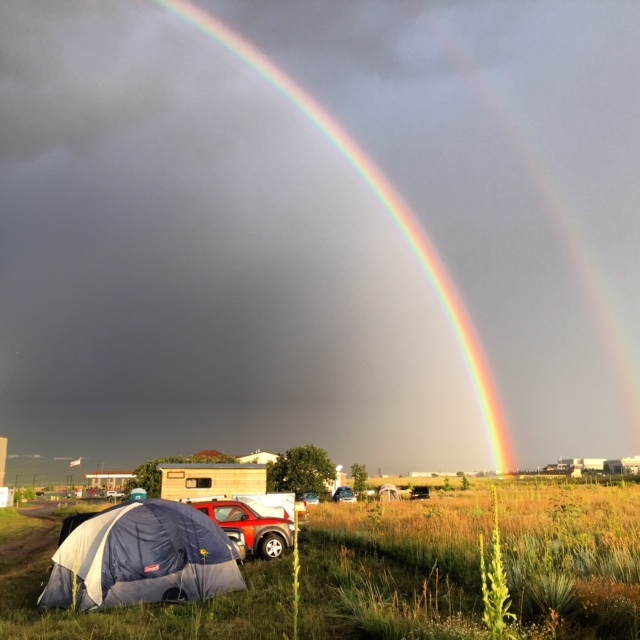 As I looked up at the twinkling stars in the deep blue Colorado sky, my heart raced with the excitement of the coming weekend’s National Tiny House Jamboree speaker’s, activities and 40+ tiny houses to tour and experience. I spoke on Sunday to a crowd of tiny house enthusiast’s about my tiny house journey. I also announced my new board game “Tinyunopoly” which will fund tiny house construction for the homeless. Here’s a picture of the 1st draft I made while waiting for my car repairs. (I was a financial consultant to the Parker Family Trust for many years). 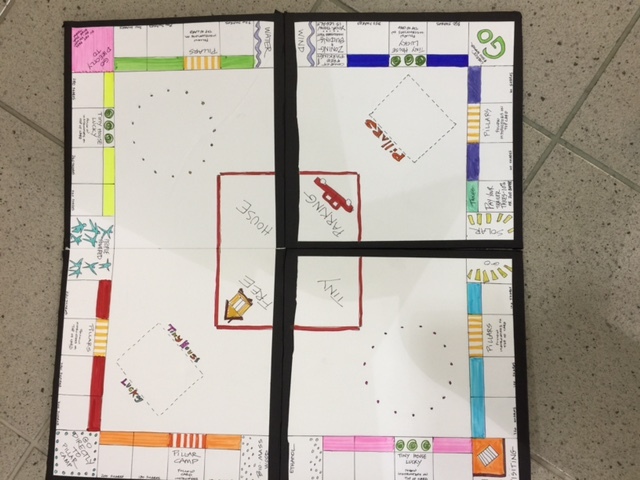 Money is not in this game, only barter shares and the gift economy. The properties are tiny house villages, the “railroads” are renewables: wind/water harvesting, solar, biomass/ethanol and people powered. No “going to jail” in this version, instead you go to sustainability pillar camp. And the four piles of cards you draw from require all kinds of fun interactions between yourself and your fellow players involving tiny house tips and tricks and sustainable concepts. If you would like to contribute feedback and help me finish the game, just let me know at taospirit@mac.com. By the end of this incredible weekend those tiny house enthusiasts’ eyes were full of twinkling tiny house stars! And on my way back to New England I saw my first tiny houses on the road! I hope they’ll have Tiny House Jamboree 2 next year! Joining a local tiny house meet-up group and networking with your tiny house enthusiast neighbors. Attend a tiny house workshop near you. 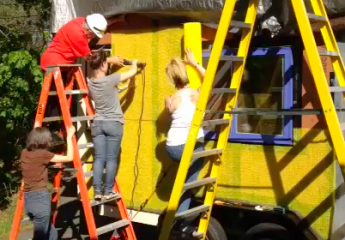 Get some hands-on experience and network with other tiny house enthusiasts. Next time you take a trip or vacation, consider renting a different tiny house every few days and learn what features you like and/or dislike. 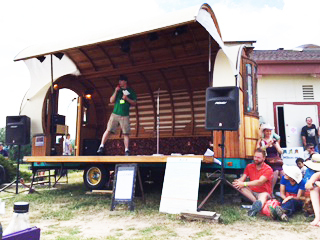 See the Tiny House Jamboree Drone video encapsulating the event in 50 seconds here. Deek’s upcoming Tiny House Summer Camp here. Join us at Deek’s Vermont Tiny House Summer Camp 3! I will be speaking at Derek “Deek” Diedricksen’s Vermont Tiny House Summer Camp, along with other tiny house luminaries! I had the opportunity to be a speaker at the Tiny House Jamboree which exceeded its expected attendance of 10,000 – it went viral and 40,000 tiny house enthusiasts came. My blog entry about that experience is coming soon. Deek’s speech was inspiring and amazing – he set the tone for this unique tiny house community event. He is included in my book, “Living the Sustainable Tiny Life”, just published, and available online here. So, mark your calendars for the weekend of September 18-20, 2015. Register as soon as you can, they get sold out quickly! For link to register, click here. Just another reminder, only 7 days left and I’ll be there! So many tiny houses to see, so many new resources to check out, yikes, I’m in heaven! I will have so much fun speaking about my personal tiny house journey. Just check out all the tiny house community founders and active leaders that I will be joining! I am so excited to meet them and all the tiny house enthusiast’s that will be joining us! I will be speaking on Sunday at 3:00-3:40PM at the speaker’s venue. I will have a 15 minute period Q & A, so get your questions ready! Colorado Springs, here I come!